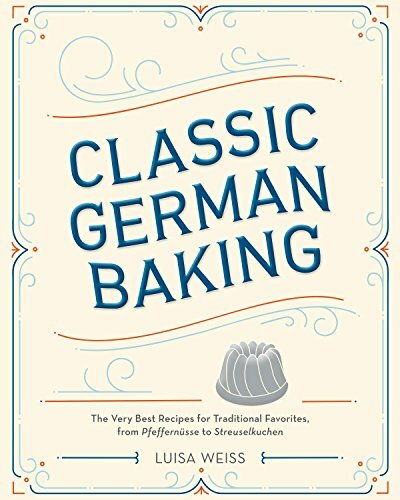 As readers might expect from someone with “Kebschull” as a maiden name, this reviewer had high hopes and expectations for a book on German baking. In Classic German Baking, author and former cookbook editor Luisa Weiss surpassed those expectations with an engaging, precise, and pitch-perfect collection of more than 100 recipes that deserve to be better known in the U.S. Her time as a cookbook editor shows: This book has just what a cookbook reader wants. With careful, concise directions that tell bakers exactly what they need to know to succeed; measurements in cups to appease American bakers, but also grams for the precision bakers really need; and exquisitely good copyediting, Weiss sets her readers up for success in the kitchen. The creator of the “Wednesday Chef” blog who previously wrote My Berlin Kitchen, Weiss was born in Berlin to an Italian mother and American father. After moves back and forth as a child to Boston and Berlin and a decade in New York as a literary scout and cookbook editor, she settled back in Berlin with her German husband and their young son. Weiss started the blog as a way to work through recipes she kept clipping, not focused on German food. So this book on German baking doesn’t have a blog-thrown-into-a-book feel; it stands on its own. Weiss takes readers through cookies, cakes, yeasted cakes, tortes and strudels, a short chapter on savory tarts, breads, kuchens and strudels, breads and rolls, and Christmas cookies and breads, plus a few basics, such as homemade quark (a rich cheese for cheesecakes and baked goods), almond paste, spices, streusel, and, of course, lightly sweetened whipped cream, which no German can go without. Many, but not all, of the recipes require European-style higher-fat butter, and some cookies need baker’s ammonia for the proper light, airy crispness. A few other uncommon ingredients pop up in several recipes, but even bakers with a basic pantry will find much to make. And once they get started, bakers will find it hard to stop. From the “simplest butter cookies” to quick, buttery almond bar cookies, to slice-and-bake crisp cookies rich with cardamom, the cookie chapter kicks the book off with confidence-inducing recipes. Skip ahead to a rich, moist, super-tender apple-almond cakey kuchen, or turn the page to a glazed apple kuchen that’s a cross between cake and pie, richly flavored with tender, cinnamon-infused apples and raisins. Lemon-scented cherry kuchen was excellent and tender on its own, or try topping it with the streusel from the basics chapter. In recipe tests, each of these proved nearly perfect. For something unfamiliar to most American palates, try the tall marbleized poppy seed cake, rich with ground, sweetened poppy seeds. Use caution when baking not to overbake at all; many of these recipes are drier (intentionally so) than a lot of American cakes, requiring extra care in baking. Or put those flavors to use in yeasted cakes—simple yeasted apple kuchen relies on the pure flavors of lemon and apple, with variations involving rum-soaked raisins, almonds or streusel; poppy seed filling and a streusel top keep a yeasted kuchen moist. Almonds, hazelnuts, chocolate and plums make multiple appearances. Or go for very plain, but hardly boring, with classic breakfast rolls, crisp and light, or a gently buttery Swiss bread with a fine, tight crumb—both ready to be slathered with butter and jam, or topped with slices of cheese and ham. Move on to Christmas cookies that deserve to be eaten at least half the year. Lebkuchen, springerle, pfeffernusse, cinnamon-almond meringue stars, almond chocolate cookies, candied orange cookies sandwiched with chocolate . . . and many more. Any complaints about this book? Mild ones at best. Weiss often notes that a recipe is best eaten on the day it’s made, but for bakers with small households, it may be hard to polish off a 9-by-13 pan of yeast cake in a day; more notes about what freezes or halves well would have been appreciated. And although she thanks KitchenAid for the loan of a stand mixer, most kneaded doughs give instructions only for kneading by hand; realistically, many bakers will be far more likely to make these doughs if the mixer tackles the work. Finally, for a generation raised on food blogs, there are already complaints online about a lack of photos. But if readers want to consider themselves real bakers, this book will take them there; with only a few minor exceptions, the precise instructions negate the need for explanatory photos, even for nearly newbie cooks. The book’s lovely photos, a mix of Berlin scenes and food shots, should be more than enough. Cookbooks rarely deliver so well on what they promise. Classic German Baking lives up to its name—and will be a classic itself. Sharon Kebschull Barrett is a food writer and the author of two cookbooks, Desserts from an Herb Garden and Morning Glories (St. Martin’s Press). She previously owned Dessert First, a custom bakehouse.